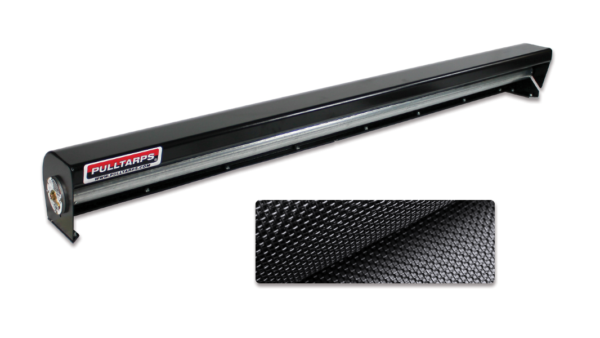 SuperShield 9500M - 93" width - HD Mesh - 20' x 88"
Designed for longer applications and can hold up to 30′ of Tarp. The radiused steel housing is fully welded for superior strength and powder coated to resists corrosion. The external ratcheting spring adjustment allows for easy spring tensioning. SuperShield™ 9500M - 89" width - HD Mesh - 20' x 84"
SuperShield™ 9500E - 87" width - Enclosed 4-Spring - 18oz. Vinyl - 24' x 84"
Steel Protector +™ (Auto) - 87" width - Enclosed 4-Spring - HD Mesh - 24' x 84"
© Copyright Pulltarps, 2018. All Rights Reserved. Pulltarps® is a registered trademark of Roll-Rite, LLC.